Every grandfather clock has an antique value. Although, any clock shows you the way time passes, the grandfather clocks made decades or a century ago stands testimony to the ingenuity and hardwork put in by those carpenters and brass workers and clock designers. Today who has the time to waste doing that. Moreover, we use composite materials or plastics to create such clocks that run on batteries. The sheer charm of a real pendulum swinging inside a grandfather clock is a nostalgic feeling I cannot forget. I have seen at least half a dozen clocks of the pendulum types in my childhood at each of my grand parents houses. Everytime I saw them, even as a child I used to stop and watch the pendulum swinging and wait for many minutes for it to stop swinging and always wondered why they never stop swinging. I still remember my grandfather climb up a chair to reach the clock hung high up on the wall out of my reach of course as they knew my curiosity is going to damage the clock. He would then use a big key and turn it many times. He would then wind the other spring also using the key in the other hole. One was for the clock pendulum to swing and needles to rotate and show the time. The second spring he used to wind was for the chime. There were two long brass levers on which two strikers would bang every half an hour and whole hour. Each half hour was ding dong and every whole number hour would be ding dong exactly as many as the whole hour at that time. It was surely pleasing to the ears. Today the clocks chime by day and don't chime by night. But the antique grandfather clock never understood the difference between day and night and would chime away as loud at night as by day. Our Antique Grandfather Clock Still Works ! The antique grandfather clock in my great grand parents homes have stopped chiming, their pendulums have stopped swinging and they show the same time even after 30 years. 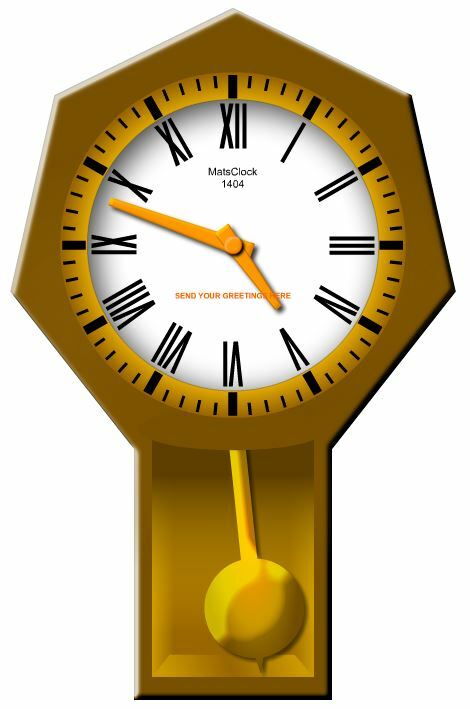 I designed this matsclock 1404 to mimic the antique grandfather clock we had at our ancesteral home which stopped the day last of my great grand parents passed away. No we did not sell it. Our antique grandfather clocks stand there to remind us of them and take us back in time every time we look at it. The still pendulum is what takes my attention. Now I wonder, when will the antique masterpiece clock's pendulum will start swinging, when will its needles start rotating and showing time. Amazingly, sometimes at night I still hear our antique grandfather clock chime in the slience of night even though the antique grandfather clock no more works. It is not my grand parents ghosts. It is just that when I sleep there, I probably go back to my childhood when our great grandfather was alive to wind the springs with the key and the clock used to ring. The video and audio were recorded in my brain permanently and they come alive and starts replaying in my dreams as I sleep. Our Antique GrandFather Clock still works !